This experiment introduces your students to Southern blotting as a tool for “DNA Fingerprinting” in a hypothetical paternity determination. 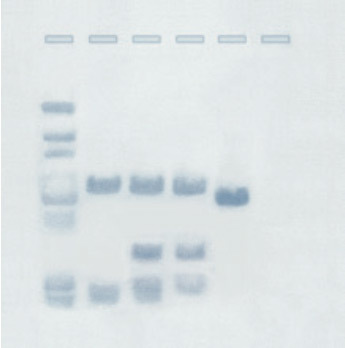 DNA fragments are first separated by agarose gel electrophoresis, then transferred to a nylon membrane and finally visualized by staining. DNA samples, practice gel loading solution, agarose, electrophoresis buffer, pipettes, 5 pre-cut nylon membranes, 5 pre-cut blotting filter papers, stain method. Electrophoresis apparatus, power supply, 65ºC Waterbath, DNA visualization system, staining net and tray, micropipettes, lab glassware, microwave, distilled water, NaCl, NaOH, concentrated HCl, plastic wrap, fórceps. 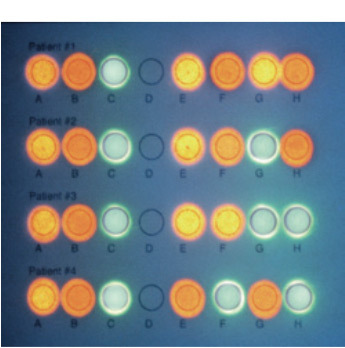 Membrane microarray technology is enabling scientists to screen large numbers of samples in one assay. This technology has led to cost savings by reducing the sample size, while saving time and yielding accurate results. Students will apply simulated DNA and RNA samples to a membrane to screen for positive and negative samples. Simulated patient DNA and RNA samples, controls, microarray cards, plastic bags to incubate membrane, microtest tubes, and pipettes. Micropipettes and tips, distilled water, beakers or flasks.